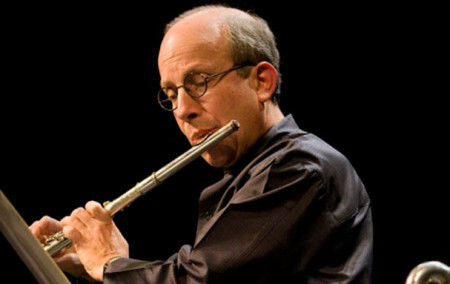 Venerable Seattle flutist, professor at Cornish, and Seattle Chamber Players member Paul Taub is one of Seattle’s best-known proponents of contemporary music, prominent nationally and internationally through his work with the Seattle Chamber Players. For this independent project, he has invited five composers to write new chamber works to be performed by some of Seattle’s finest “new music” instrumentalists. Composers Tom Baker, Andy Clausen, David Dossett, Jessika Kenney, and Angelique Poteat have been chosen to participate in this project because of the high artistic quality of their work, the diversity of their styles, the varied stages of their career trajectories, and above all, because their music truly speaks to the public. The new works will be for various combinations of flute, clarinet, cello, contrabass, piano and percussion, written for Taub along with stellar instrumentalists Laura DeLuca (clarinet), Walter Gray (cello), and Joe Kaufman (contrabass), members of the Seattle Symphony; and Cristina Valdes (piano) and Matthew Kocmieroski (percussion), who are leading Seattle-based American interpreters of contemporary music. Presented by Nonsequitur with assistance from Seattle Office of Arts & Culture and Second Inversion.